You are here: Home / Breakfast / Word of Mouth AGAIN! There are 2 things I really enjoy. Going to Word of Mouth in Salem and Sharing the love. Read on to find out exactly what I mean by “Sharing the Love”. If you have never been to Word of Mouth here is something you should know. The lines get long and it’s totally worth the wait. TOTALLY worth the wait. I have waited, with a party of 6, for an hour, and every person in our party was completely wowed by the experience. The owner, Becky, actually knows me now. I mean, I have written the place up numerous times and done a few giveaways. She also follows me on Facebook, so she knows all the places I eat. The day before heading back to Word of Mouth we had tried a new place, and it was a complete fail. It’s a place where you make your own pancakes. (Not sure why I thought that was a good idea.) Anyways, when she found out I was coming she made me a Vegemeatavitamin pancake. I think she was trying to help me get all the bad memories out of my head. It worked. This pancake is like carrot cake meets zucchini bread, grilled up with crispy edges. YUM! It might sound odd, but I think I actually liked it more than the Cinnamon Roll pancake and the Red Velvet pancake. This thing was good. Bad memories erased I was ready for my entree. My husband was super excited about the Pork Carnitas burrito that was also being offered when we were there. This thing was ginormous. He was able to enjoy half of it before he raised the white flag of surrender and boxed the last of it up. My husband really tends towards these kinds of breakfast entrees. I did try it and it was very good with the big chunks of meat and great verde sauce on the outside. Another win. I tend to base all my other breakfasts prices with that of Word of Mouth. 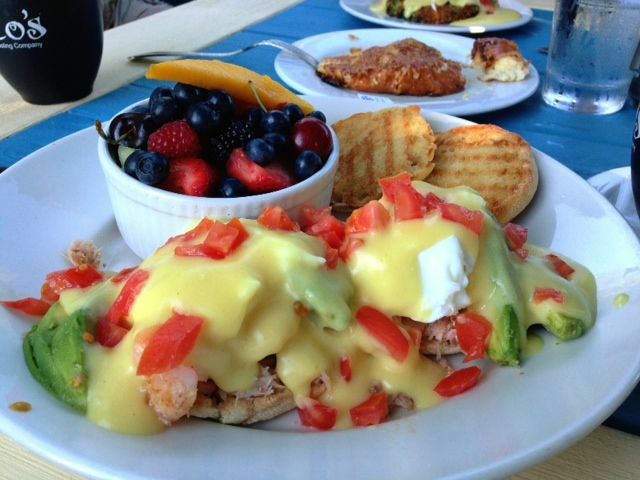 The traditional Eggs Benedicts are $10.95 and it’s a 3 egg Eggs Bennedict that comes with fresh fruit or potatoes. All their meals are easily shareable unless you just want leftovers. There have been a few times that I actually finished my whole meal, but it’s so large I rarely do. Maybe you are one of my Portland readers and you are thinking there is no way this place is worth the drive. I am telling you it is. If you don’t believe me, enter to win and try this place out for yourself, then we will talk. All you Salem readers…I’m just jealous your so close. This giveaway will close on July 3rd. I will announce the winner the evening of the 3rd. The Winner is Shawna H.
Following & following . . . Pretty much everything on their menu looks amazing but I’d love to try the Creme Brulee French toast!!! Never been, but sounds AMAZING! I would never be able to decide on one thing… Biscuits and Gravy are a must try but the Crème Brulee’ French Toast is really calling my name, too. and BTW, I’m already following both ya guys! I first came for their amazing biscuits and gravy, then fell in love with The Flying Biscuit, but they gave me a sample of the Creme Brulee french toast and now I am hooked! I always end up ordering it. I live in Salem and have not been to WOM yet!! I would love to go and try their cinnamon roll pancakes. I liked your Facebook page and WOM!!! Thanks!! Following you and WOM. You can’t go wrong with the Flying Biscuit! I just moved to Salem and Word of Mouth is the best restaurant Salem that I have come across. It’s great to hear that you choose them as a top breakfast spot! I quickly became a FB fan of theirs and they posted about your giveaway. I am now a FB fan of yours. Everyone is winning. I must try the eggs benedict at WOM now. Thanks for the advice! They are a favorite of mine that I wouldn’t ever try at home. Can’t wait to go back to WOM! Can’t. Wait. I am a faithful WOM follower! Ah! There are so many things at WOM I have yet to try- your seafood Benedict looked spectacular. I am a big fan of every single thing I’ve ever eaten there, particularly the plate of love! Mmmmmm! It really is the best breakfast (or lunch) place around! Now following you and already follow WOM. My favorite is the Incredible Flying Biscuit. I agree, they have amazing Hollandaise. They also have yummy salads during the summer with fresh heirloom tomatoes, drool. 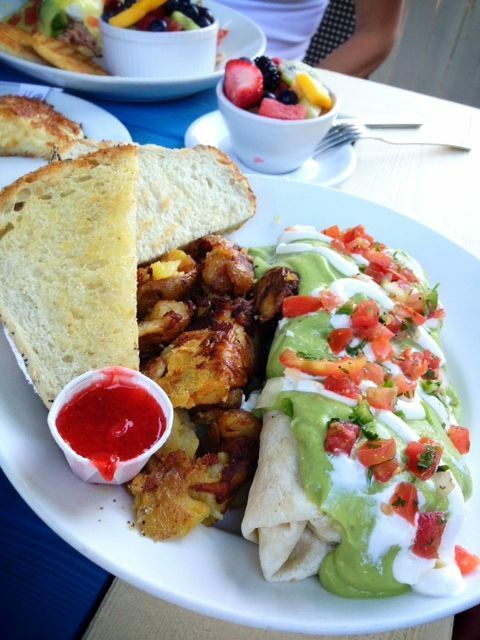 I live about 5 blocks from Word of Mouth, and love to walk there for breakfast. The walk there and back helps work off a tiny part of the Biscuits and Gravy – my favorite. Although, sometimes I mix it up with the Green Eggs Sans Ham Omelette or the Sausage, Artichoke & Feta Wrap. And I almost always get a slice of Creme Brûlée French Toast on the side. Yumm… I’m salivating just thinking about it! I’ve followed WOM on facebook for ages, and I now follow you! I learned about this blog from the WOM facebook and so far am impressed. WOM is the best place to eat in town (yes, I live in Salem) and my kids are willing to wait to eat there longer than they are willing to wait in a line at Disneyland. My son even picked it as his birthday meal last month when he turned 13. Since you have good taste I will need to visit some of your recommended Portland spots on our next visit up. Oh, and my favorite item hands down is the Chicken Fried Steak. So so amazing. Definitely following you and WoM on Facebook! Currently, my favorite menu item is the Plate o’ Love – hash and creme brulee french toast? Can’t beat that! And there’s so much good food for a good price – always important when working with a college budget! I think I would have either the Flying biscuit, the carnitas burrito, or the cinnamon roll pancakes. Or other stuff, lol! I haven’t had anything there I didn’t like. And the fried potatoes are to die for! That place is awesome, and yes, worth the wait, although sometimes we call in an order to go! And I follow both you and WOM!! I love Word of Mouth!!! I would definitely order the biscuits and gravy!!! It’s wonderful, although the ginger snap pancakes are very yummy as well!!!! I love The Incredible Flying Biscuit!!! Following you on Facebook. Was already following and a huge fan of WOM 🙂 We go every time we visit our daughter at Willamette. Sometimes we go two days in a row. I love the corned beef hash. And the accidental omelet and the caprese. Basically anything on the menu. Followed you both. Never been there, but looking at the menu… I’d have to say the Eggs Benedict! I’m a fan of word of mouth!! I a Big fan of eating my way thru portland!! Word of Mouth is one of Salem’s true culinary gems. My favorite item on their menu is the Prime Rib Eggs Benedict. So fantastic. 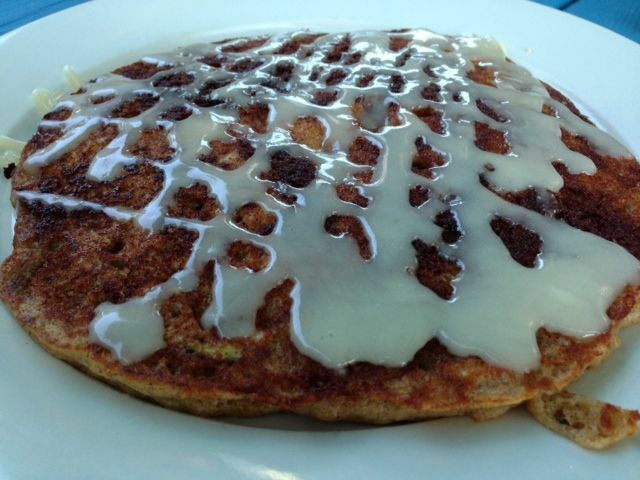 Not to mention their Cinnamon Roll Pancake. Really, I’ve never had a bad meal there. I love the traditional eggs benedict, though I can say their french toast, cinnamon roll pancakes, chicken fried steak, and biscuits and gravy are all amazing! I already follow you on fb & am an avid follower of WoM. The staff are FABULOUS & they will swap out/customize your order without fuss. They truly are the BEST, which is why I go weekly! My absolute favorite menu item is only available for the short season when heirloom tomatoes are available. Becky will coat the tomato slices in parmesan and then pan fry them, layer with mozzarella & basil and add in some ham. It seriously is what I’d want for my last meal, if it ever came down to it. Jennie I have had those and they are the best!!!! Anything she does during tomato season is spectacular. Her tomato soup, her eggs benedict smothered in heirloom tomatoes….I could go on! I cannot wait for Heirloom Tomato Season- about 6 weeks, if it stays hot. OH… I absolutely adore the fried, cheesy tomatoes.. now you motivated me to have more of that special while I can.. I have heard about this place and can’t wait to try it. I want to order the eggs benedict AND I liked their Facebook page. Yours was already liked. Thanks! I’m in Salem once or twice a month and would like to try the “Flying biscuit” at Word of Mouth Bistro!